PreparationMix 3 – 4 tbsp of Aachi Vatha kulambu rice paste to 400 – 450g of cooked rice. Garnish with coriander leaves and serve.IngredientsVathal, Tamarind, Refined Vegetable Oil, Red Chilli Powder,..
PreparationMix 3 – 4 tbsp of Aachi Tomato rice paste to 400 – 450g of cooked rice. 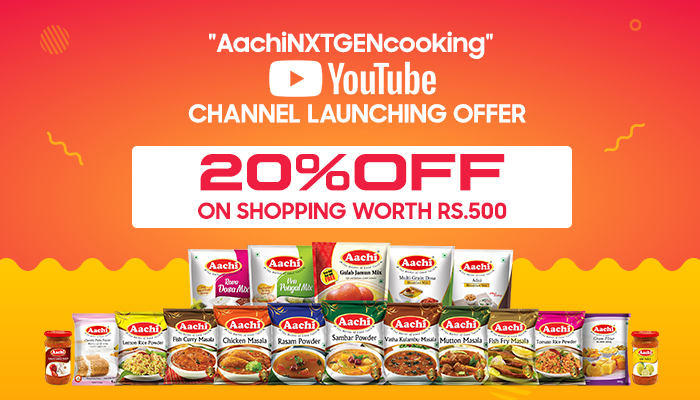 Garnish with coriander leaves and serve.IngredientsTomato, Onion, Refined Vegetable Oil, Red Chillies, Salt, Cinnamon..
PreparationMix 3 – 4 tbsp of Aachi Briyani rice paste to 400 – 450g of cooked rice. Garnish with coriander leaves and serve.IngredientsVegetables – Tomato, Carrot, Beans, Onion, Green Chillies, Garlic..
PreparationMix 3 – 4 tbsp of Aachi Lemon rice paste to 400 – 450g of cooked rice. Garnish with coriander leaves and serve.IngredientsLemon Juice, Refined Vegetable Oil, Green Chillies, Salt, Asafoetid.. Ingredients:Tomato, Edible vegetable oil, Onion, Salt, Garlic, Ginger and Red chilli powder.Directions:Mix about 2-3 table spoon of the paste with 400-450g (as per your taste) of cooked rice. Garnish ..
PreparationAachi Tamarind Paste is best for preparing Sambar, Rasam and any curry of your choice.IngredientsTamarind and Salt.CONTAINS PERMITTED CLASS II PRESERVATIVE E211..
PreparationMix 3-4 tbsp of Aachi Coriander Thokku to 400-450g of cooked rice. Garnish with coriander leaves and serve. It may also be used as a side dish for Idly, Dosa, Chappathi and poori.Ingredient..
PreparationMix 3-4 tbsp of Aachi Brinjal Thokku to 400-450g of cooked rice. Garnish with coriander leaves and serve. It may also be used as a side dish for Idly, Dosa, Chappathi and poori.IngredientsB..
PreparationMix 3-4 tbsp of Aachi Pudhina Thokku to 400-450g of cooked rice. Garnish with coriander leaves and serve. 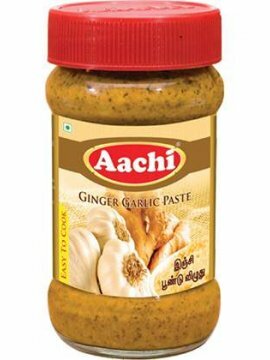 It may also be used as a side dish for Idly, Dosa, Chappathi and poori.IngredientsF..
IngredientsGinger, Garlic, Salt and Citric AcidCONTAINS PERMITTED CLASS II PRESERVATIVE E211..